What to know: Amazing film about imagination and a boy whose best friend is a tree. What a delightful film about imagination and friendship. I love that Miles' best friend is a tree. We see what friendship means to Miles and his best friend, the tree, as they embark on a wonderful summer day, exploring fun things. The most appealing thing is definitely the 2D animation. It is creative, colorful and vibrant. I had such a amazing experience watching this short film because the animation truly brings the story together as well as the creative kid friendly locations. It truly entertained me from beginning to end. I enjoyed the boy's explorations and the storyline I definitely think other kids will too. Who wouldn't like exploring all the fun places that he does in his imagination. I definitely recommend it for the KIDS FIRST! Film Festival and give it 5 out of 5 stars. I recommend it for ages 4 to 10. Reviewed by Nathalia J. and Julie S., KIDS FIRST! Film Critic and KIDS FIRST! adult juror. Miles is a little boy whose best friend is a tree. Together they venture on a roadtrip and enjoy a perfect Summer day at the funfair. 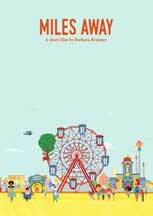 "Miles Away" is a short movie for kids, with one simple message: You'll never be lonely or bored as long as you let your imagination lead the way.